"They are distinguished by their gigantic size, they are the largest of the kind I have ever seen, and as perfect a make as possible in pigs... their heads are large, with very long ears hanging down on each side of the face, so that they can scarcely see their way"
The pedigreed Large Black Pig is a traditional, heritage breed and was first imported to Australia from the UK in the early 1900's. It has its origins in the Old English Hog of the 16th and 17th Centuries and, by the late 1800's, the main strongholds of the breed were in East Anglia and Devon & Cornwall. Two distinct types of pig were produced and the founding of the Large Black Pig Society in 1899 led to an increase in the exchange of stock between breeders in the two localities, which in turn, led to a standardisation in type. The first reference to them in the Australian Pure Bred Pig Herd Book was in 1912. They were prized for their superior milking and mothering abilities and soon became popular with early Dairy Farmers who fed them whey from separated cream as part of their butter making process. They proved economical to keep, being excellent grazing pigs and were also used to pick up windfall fruit in orchards. Their black colouring enabled them to withstand the hot Australian summers and avoid sunburn. These virtues, coupled with their hardiness and docile temperament made them eminently suitable for free-range pork production. They were sometimes referred to as "British or English blacks" due to their country of origin but their official name is simply the Large Black. 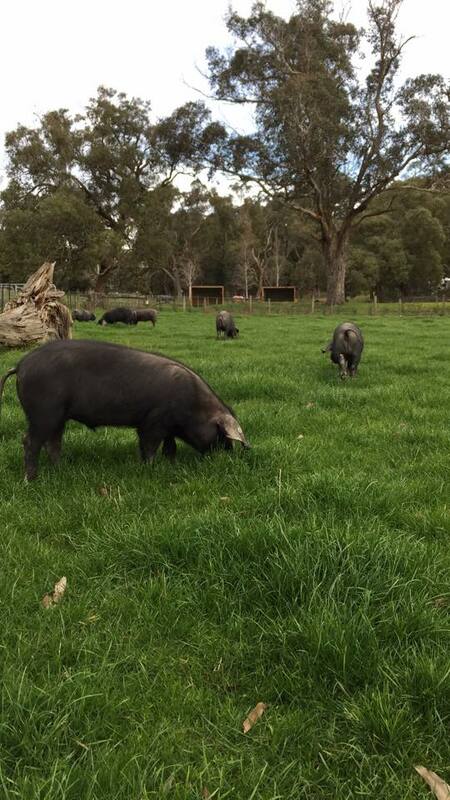 Christine Ross began breeding Large Black Pigs at Macclesfield in the Yarra Valley in 1993 with the purchase of her first sow, Purrumbete Gypsy from two elderly pig breeders. These gentlemen ran the Purrumbete Stud near Colac in Victoria and were brothers in their eighties. They had kept the breed going since the 1940's because 'you couldn't buy grain for livestock after the war, and we knew these pigs could survive on grass'. 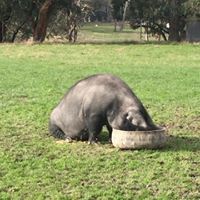 Christine soon found that there were no other breeders in Victoria from which to purchase an unrelated boar and she thus began research into this critically endangered breed. Her extensive investigations Australia wide, unearthed six more sows in rural Victoria and, a boar and sow owned by Bruce Ranclaud from the Green Gables stud near Tamworth, N.S.W. These proved to be the last purebred Large Black Pigs in Australia and, until that time, the breed was headed for certain extinction. Her efforts in collecting individual pigs and forming them into a viable breeding herd has held off that threat, for now at least. These pigs formed the basis of the Eastwind Herd as it is today, consisting of thirty sows and seven boars. The next step was to promote the breed with the aim of convincing other people to also breed them and to spread the genetics around. This is of particular importance when all of the genetic resources are held on one farm in case of a physical threat such as disease or a disaster that could threaten the entire population. As Christine also worked in the film industry, she had many contacts in this area and used them to her pig's advantage. The story of the old breeds captured the imagination of a few journalists and several articles were written in the rural press. A current affairs program on the ABC also ran an informative piece on prime time TV. Christine became a founding member of the Australian Rare Breeds Trust and attended many field days and displays promoting her pigs. People at last began to take an interest in the old breeds and some of them bought pigs and began to breed. Most of these people did not continue with their pigs and only a few kept them pure and registered progeny. Of twenty-one breeding groups sold by Christine from 1997 to 2007 only five breeders have registered any stock in the Australian Pure Bred Herd Book and two of those have now also ceased breeding. Some people were interested in taking advantage of the growing resurgence of rare breed pigs due to the publicity in the media and crossed them with other pigs to form unregistered herds that looked like Large Blacks but that had no authenticating pedigree. This was done largely by people not wishing to pay the price for registered animals upon which to base their herd. Registration is essential to the survival of all pure breeds but more especially in the case of a rare breed that relies on keeping track of its few remaining bloodlines. Christine frequently has people call to ask if she can provide breeding stock to go with pigs previously bought from elsewhere and that are unregistered. She is unable to help these people without knowing the bloodlines of the pigs they have. Christine’s pigs are produced in a welfare friendly system. Breeding sows live outdoors and, have access to large straw bedded pens. After farrowing they are confined after dark in this safe environment for approximately three weeks. This is to protect piglets from predators. Piglets are never weaned before eight weeks of age. They are grown outdoors where they graze to maturity on improved pasture to produce pork with traditional taste and flavour. Christine’s delicious pork can be ordered to be picked up at the following farmers markets. The trend towards intensive farming and away from free-range production in the 1960's meant that many of the 'old' (traditional) breeds of farm livestock were no longer suitable for the commercial farmer. Breeds like the Large Black were considered to grow too slowly and to put on too much back fat. Farmers wanted to make quick profits and therefore were prepared to sacrifice quality for quantity. Most commercial farmers began to house sows in large sheds where they could be closely monitored and they soon lost the ability to fend for themselves. Due to their excellent mothering qualities, some Large Blacks were retained in these herds and crossed with white boars to produce white and roan pigs for the commercial markets. There was however, no use for purebred Large Black boars in this system, which soon led to a rapid decline in purebred numbers being registered. There are approximately 60 registered breeding sows left in Australia. In the Australian Pure Bred Pig Herd Book of 2009 two breeders registered eight young stock. Christine is just one of a growing number of people throughout the world concerned at the rapid decline of genetic bio-diversity in plants and animals. They believe that these animals are part of our HERITAGE just as much as old buildings and significant trees and that we are custodians of this priceless genetic material for future generations. Seek out breeders selling genuine pedigreed Large Black pork (and other traditional pig breeds) at Farmers Markets. Ask your butcher to stock pork from genuine free-range pigs. Don't be fooled by the term 'bred free-range', read the packaging, do your own research.